Gerbil Invasion is an odd sort of game for your Windows Phone. Odd in the fact that you are battling an invading army of gerbils but also how you battle them. You use a trampoline. You work your way through the ranks by earning points as you bounce these furry little critters into oblivion. There are three game modes to give Gerbil Invasion some variety. Game play is decent but overall, Gerbil Invasion is more of an acquired taste than an across the board attraction. The object of Gerbil Invasion is to cut the parachutes out from over the gerbils and use the trampoline to bounce them off the screen. You swipe the screen to cut the parachutes and the trampoline can be moved by either tilting your phone or tapping/sliding it. 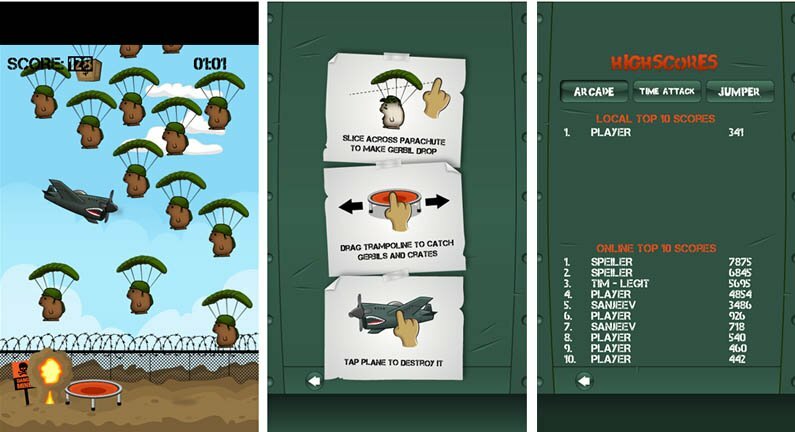 To make things interesting a fighter airplane will cross the screen from time to time, slicing through the parachutes. Arcade Mode: Arcade mode sees an endless stream of invading gerbils and your job is to bounce them off the screen for points. If you miss a gerbil, they hit the ground and explode. Miss five gerbils and the game is over. Time Attack Mode: Time attack has the same onslaught of gerbils but this time, you try to earn as many points within a two minute period. Missed gerbils do not count against you in the Time Attack mode. Jumper Mode: Jumper mode has you cutting the parachutes and instead of bouncing the gerbils off the screen, you bounce them straight back up. Gravity kicks in and they fall back to the ground so you've got to keep them bouncing up and down. The challenge comes in that you can't let more than ten gerbils crash into the ground. The longer they jump or bounce, the more points you earn. It can get rather challenging bouncing five or six gerbils at one time. Controlling the trampoline with your finger is the most accurate method but your finger does get in the way at times. Using the tilt control gives you a better view of things but the control isn't as accurate in positioning the trampoline. Gerbil Invasion does have a online leader board and bonus items will fall (mainly bonus points). Graphics are nice, game play challenging and overall Gerbil Invasion is a decent game for your Windows Phone. However, it lacks that intangible quality to give it an addictive feel. It's one of those games that you either like it or you don't with very little in between. The good thing is that Gerbil Invasion is a free game for your Windows Phone. Trying it out won't set you back but the few minutes it takes to install and you may end up liking it. You can find your copy of Gerbil Invasion here at the Windows Phone Store.